Terrain/Fuels: Heavy timber in steep terrain. IA: 60-70 acres, A-512, T-93, T-23, C-512 enroute, From tanker in air, smoke showing good from valley. 1700- Jumper 51 dropped 10 jumpers who were on their way home from a prepostion in Fresno. 1530- T-23, T-88, T-89, T-93, AA06, copter 510, 512, 68AH and Jump 51. Using Chester air base. Road Closure: Highway 70 is closed in both directions from one mile west of the Jarbo Gap in Butte County to the highway's junction with Highway 89 at the Greenville Wye in Plumas County, California Department of Transportation spokesman Michael Mayor said this evening, The highway may be closed until noon Sunday, Mayor said. Resource orders:Air resources: AA 06, T-93, T-88, T-89, H-512, H-510, H-514, H-522, 58AH. Air attack put in an order for 2, type 1 copters but none were available. All tankers loading out of Chester. Evacuations orders rescinded - The Los Angeles County Fire Department and the Los Angeles County Sheriff’s Department appreciate the cooperation of residents in complying with evacuation orders. Road Closures/Access: Road now open from Elizabeth Lake Road to Godde Hill and Bouquet Canyon. Access will be limited to residents only. Access continues to be limited to residents only in the following area: Godde Hill Road from Elizabeth Lake Road to 60th Street West and Avenue N.
For the latest road closures please go to Public Works Web site. VLAT: Both the Evergreen Super Tanker( Boeing 747) and Very Large Tanker 911(DC-10) were used concurently for suppression on this fire. Last nights weather allowed fire crews on the ground to continue to strengthen control west flank lines of the fire. First responders will continue to be working in the affected areas and firefighters will continue to construct lines, work on any remaining hot spots and patrol the area. keep firefighters protecting the residents and businesses of San Jose. In a final attempt to avoid drastic fire and medical service reductions that will put San Jose residents and businesses at risk, San Jose firefighters will announce a new proposal to the City. The details of the proposal will be announced tomorrow. The loss of 49 Firefighters and closure of 4 fire engines and one fire truck will increase emergency response times and put lives and property at greater risk. The firefighters' offer will allow the City to keep the 4 fire engines and fire truck in service. West Fire caused by equipment use. Kern County Arson Unit along with CAL FIRE Law Enforcement has determined that the cause of the West Fire was from equipment use. Daniel Gentle 47, and Michael Kulikoff 23, were cleaning the property at 16650 Blackburn Canyon Road. The two men who had permission to be on the property were cutting steel pipe with a mechanized saw causing sparks which ignited near by brush. The two men have been cited for a misdemeanor under PRC 4435 for causing a fire using mechanized equipment. ICP: currently on Glendora Mt.Rd. Resource List as of 1330hrs Incident 3232, the following ANF units are at scene - WT22 WT25 Pat21 Pat25 BC21 Crew3 Div2 E23 E25 E26 E27 - E14 is still responding. 1525hrs- LACO engines being released . ANF and crews handling mopeup. E82, E152 & E103 to remain..
1445- 50% containment, crews will be working until 1800. DC6 passing command back to AC41. 2000- 15 acres with 80% containment. Releasing Air Support. AC41 requesting ambulance to respond and standby at the command post. 1230- ICP on Glendora Mt.Rd. 1226- LACoFD & ANF onscene- 7 to 10 acres in heavy fuel. 1144- No rescue in progress, found TC victim. 1207- 2nd Alarm unit to stage at ANF station on Glendora Mtn Rd, E32 staging Manager. 1200hrs - *Glendora IC* requesting 2nd Alarm, Usar TF103 also enroute for TC Over The Side., E151 is manning HS86C, crews unable to check for vehicle over the side due to heavy fire. CA-Crown Fire: YouTube Evergreen 747 Super Tanker T-979 on fire yesterday. graffiti, illegal dumping, and blight. code violations to San Bernardino County Code Enforcement officers. and send the complaint to a Code Enforcement Officer for investigation. reporting process for many residents while increasing the efficiency in which violations are addressed. versions for other operating systems as well, such as BlackBerry. Nationally, there are 54 large fires being managed to achieve multiple objectives. Fire Fuels/activity: 20+ square miles, Chaparral. Active fire behavior. Numerous structures and major transmission lines threatened. Evacuations lifted. Additional Information: Four residential homes destroyed. Last nights weather allowed fire crews on the ground to continue to strengthen control west flank lines of the fire. Conditions continue to be very fluid and may change quickly based on weather factors. The threat to the power lines has decreased significantly. Road closures and access: Access is also now open from Elizabeth Lake Road to Godde Hill and Bouquet Canyon. Access will be limited to residents only. Access continues to be limited to residents only in the following area: Godde Hill Road from Elizabeth Lake Road to 60th Street West and Avenue N.
West Fire - Kern County (CA-KRN-021461) 1,658 acres, 85% contained. Location: 4 miles S/SE from theTehachapi community. 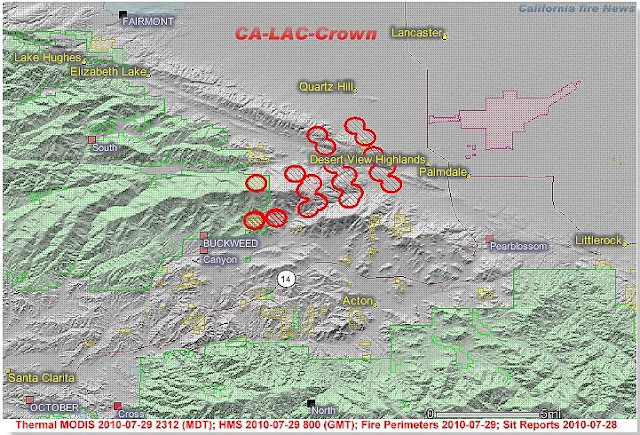 Lat: 35° 3´ 29" Long: 118° 25´ 33"
Fire activity: Moderate with occasional torching. Significant Events: No significant fire growth. Completed re-entry of displaced residents. Remarks: Potential for spotting via wind driven brands, dust devils, and torching continues. Diminished threat to the electrical infrastructure for the city of Tehachapi, wind generator farms, and to structures. Observed Fire Behavior: Occasional torching through pinyon pine mortality areas (40%). Smoldering with pockets of activity in 1000 hour fuels. Planned Actions: Continue with mop-up. Demobilize excess resources to support new fires and initial attack. Bull Fire - Sequoia NF (CA-SQF-2701) 16,460 acres, 65% percent contained. Location: Kernville, Ca - Lat: 35° 52´ 28" Long: 118° 27´ 9"
Fire activity: Creeping and smoldering. Numerous residences threatened. Remarks: There are still forest and road closures in effect. Briggs Fire (CA-ANF-3201) FINAL - 530 acres, 100% contained. Significant Events: Evacuations of campground in Soledad Canyon was lifted. Soledad Canyon Road is open. 100% containment as of 1800hrs. on 07/30/2010. Planned Actions: Continue mop up and holding operations. McDonald Fire, CA-NOD, is 10,677 acres and 75 percent contained. Crown Fire (CA-LAC-169211) 8,000 acres, 5% contained. Briggs Fire (CA-ANF-3201) 561 acres, 52% contained. West Fire (CA-KRN-021461) 1,658 acres, 46% contained. Bull Fire (CA-SQF-2701) 16,460 acres, 55% percent contained. Constantia Incident, NV-CCD, is 100 percent contained at 1369 acres. Russel Complex, CA-LMU, is 100 percent contained at 100 acres. Fire under local command. Birthday Incident, CA-MDF, is 100 % contained at 147 acres. McDonald (W-23), Northern California District, BLM. IMT 2 (Swartzlander). Three miles northeast of Termo, CA. Juniper, brush and grass. Active fire behavior. Residences threatened. threatened. Evacuations in effect. No further information received. with occasional torching. Residences threatened. Evacuations in effect. Bull, Sequoia NF. IMT 1 (Opliger). Eight miles north of Kernville, CA. Brush and grass. Creeping and smoldering. Numerous residences threatened. 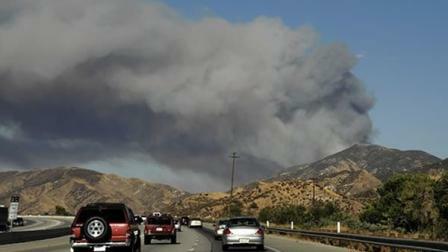 Seen from the 14 Freeway, a fast moving wildfire burns near Acton, Calif. on Thursday, July 29, 2010. Location: LA County off Hwy 14 and Crown Valley near Agua Dolce, Fire is burning north of Sierra Highway at Anthony Road. Update: From a county source, it was McDill that burned, not Hauser. Hauser Peak. (Radio system) Fire Damaged. 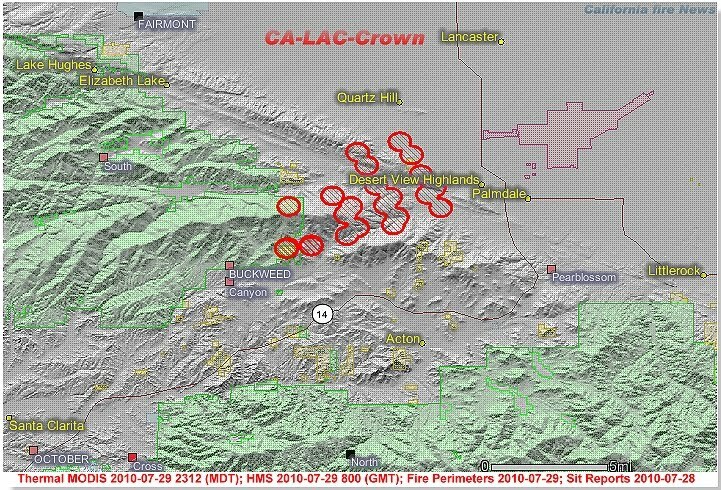 Due to damage at Mount Hauser Radio reperter/microwave site FIRE and LEO radio repeaters are currently disabled, LACoFD utilizing the Whitaker Peak repeater site for Blue 4, 8, 11, 12. 2400hrs: Everyone on the fire-lines stay safe tonight #LCES - 10 Standard Fire Orders - 18 Situations That Shout Watch Out! - Go Home in 1 piece.Several Strike Teams are at the Palmdale staging area. They will rest overnight & relieve the crews that are working now in the A.M.
2300hrs: 6000-7000 est acres, LACoFD & LAFD will continue Air Ops throughout the night as long as possible. Structure protection in place. WX: Winds now averaging 20 kts, down from 25-35 at 2200 hrs. Predicted to be light at 0600. Temps dropping quickly, now 79, down from low 90's at 2200 hrs. Temps predicted to be 100 degrees tomorrow. 2100hrs: Structures lost on Mt Hauser and LACSD and Fire radio repeaters down in the north county due to damage, CBS Copter2 showing one of the buildings on the repeater site burning. 2030hrs: Estimating fire is at 5500+ acres now 0% containment. 2000+ homes under mandatory evacuation orders, Fire has reached homes on Boquet Canyon Road - Fire will back down toward Godde Hill Rd tonight, Request for 12 additional WTs will be filled by 0900, Repeater sites on Mt McDill directly threatened. LA County IMT has been activated for this fire.KCAL TV-9 helicopter video showed fire encroaching in the doorway of the Hauser Peak county radio building at about 2030hrs. 2000hrs: IC requesting 4 ATs, 1 Lead and 1 AA for tomorrow morning, Orange County Copter 3 enroute. 1930hrs: Briggs Ops is releasing resources to the Crown IC Continuing Mandatory evacuations for parts of Leona Valley. 1900hrs: Type 1 ST to report to Elizabeth Lake Road and 20th Street West, IC requested 4 additional airtankers - Per South Ops, highly unlikely they will be able to fill 4 additional ATs in time to work tonight. 1800hrs: *Crown IC* Fire at 800+ acres. Mandatory evacs for parts of Leona Valley. Calling for aerial drops due to structure threat, *Briggs IC* Releasing E 82's, E 149's, E132's, E 111's, E 76's & WT 73's to the Crown IC as per their need with Strike Team 1170C is to form up under the command of BN 5A and stage at Ave S @ 14 Fwy. 1740hrs: Crown IC has established 2 staging areas for the Crown Incident. First on the South end of the fire is at Highway 14 x Red Rover Road, and the second is in Leona Valley and known as Valley Staging and is located on Elizabeth Lake Road between Ridder Road and Godde Hill Road. 14505hrs: 80-100 acres, IC requested a 2nd alarm, Total of 4 AT's on this fire now.There are at least two starts. One start was on Crown Valley Rd, the other on Anthony Rd. 1430hrs: Multiple Structure threats, at least 5 acres in medium to heavy brush and grass. This is the 3rd fire in the area burning at the same time. 14:22hrs: Fire reported 3 to 5 acre sizeup. 2145hrs: 4 Type I Strike Teams just launched from Orange County – 2 ORC and 2 XOR from Metronet. Updates as of 7:28pm 7-29-30: Briggs IC* Per IC final acreage was 530. Activities throughout the night will be tying in containment lines. *Briggs IC* Reporting Knockdown @ 20:03 Hours. Extensive mop-up and cold trailing ahead w/ handcrews & Dozers. Location: South of the 14 Freeway, near Soledad Canyon Rd, burning towards Angeles National Forest. It is burning in a semi-rural area toward the old North Fire footprint from Sept. "06" and the Station Fire Aug. "09"
Moderate rolling hills with some steep inclines. I heard a frightening story this week. A firefighter did not report for his shift. His fellow firefighters stopped by his apartment, where they found his body. The co-workers called 911, bringing out paramedics and later the fire chief, all devastated by the loss. Other firefighters who weren’t on scene learned of the death via text message. The texts and cell phone calls quickly spread and eventually, news of the firefighter’s death appeared on Facebook. While en route to notify the firefighter’s estranged wife, the fire chief started receiving instant messages and texts asking about the death. “We were so afraid his wife would hear it from a text or phone call before we could tell her in person,” the chief told me. Fortunately, the wife was late getting home and doesn’t answer her cell while driving, so the chief was able to break the news to her in person. He added that a couple hours later, the wife started to compose a list of people to notify —family, friends and military buddies. “Of the 10 names on that list, five had called because they saw it on Facebook,” he said. 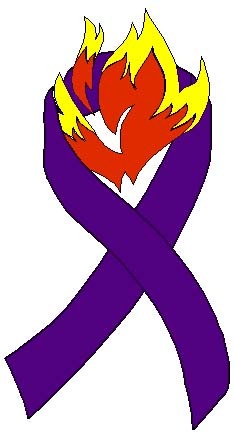 Last month, my family learned of the sudden death of a young friend of my daughters’ via Facebook. The news itself was shocking, but it became quickly obvious that the family and close friends were not prepared for the deluge of phone calls of concern. While newspapers and television news will hold the name of victims pending notification of family members, smartphones put the grapevine or phone tree on steroids. There are plusses and minuses with today’s instant news delivery. For instance, departments can mass-deliver tornado warnings or evacuation-route update via texts. But can you imagine what would happen if tragic or incorrect information was sent out? I’m just finishing the book, The Facebook Effect by David Kirkpatrick, the story of the origins of Facebook and its role in changing how people communicate. Facebook founder Mark Zuckerberg’s idea not only connected college students and high-school students, it opened up the world. Adults have found a new way to connect with family, friends and reconnect with people from the past, witnessed by Facebook’s announcement that it had reached 500 million users. A couple years ago, I cautioned about first responders taking photos and posting them on Web sites, but how do you set rules or etiquette for texting or posts on Facebook, Twitter or whatever comes next? How do you manage this new breed of social media reporters? CAL FIRE crews are battling a 10 acre fire off New Idria Rd in the community of New Idria (San Benito County). New Idria Fire now 100% contained at 20 acres. Abandoned ghost town. IC reports many out building and structures destroyed. Update: 1100 - New Idria IC, reported that everything on the North side of center in the old mining town of New Idria is destroyed...abandoned mining town. Siding with an environmental watchdog group, a Missoula judge this week ordered the U.S. Forest Service to take a hard look at its use of toxic aerial fire retardants and their impact on fish and wildlife habitats. In a 79-page decision filed Tuesday, U.S. District Judge Donald Molloy ruled the Forest Service violated the federal National Environmental Policy Act when it determined the chemical slurry has only insignificant environmental effects. Pointing to government studies that show fire retardant dropped into creeks and on rare plants threatens the survival of endangered species and their habitat, Molloy said the Forest Service's current assessment is inadequate and ordered the agency to prepare a rigorous Environmental Impact Statement. Ammonium-based retardants are toxic to fish and other aquatic organisms, and promote the spread of flammable invasive weeds. The Forest Service Employees for Environmental Ethics, an Oregon-based nonprofit group, filed suit more than two years ago in U.S. District Court in Missoula. The lawsuit names the Forest Service, the U.S. Fish and Wildlife Service and the National Marine Fisheries Service, and accuses the three agencies of violating NEPA, the Endangered Species Act and other federal laws. Molloy ordered the Forest Service to comply with the federal laws by Dec. 31, 2011, threatening contempt sanctions if the agency fails to do so. "The Federal Defendants are advised that failure to comply with this deadline may subject them to sanctions, including contempt proceedings, and could conceivably result in enjoining the continued use of aerially-applied fire retardant until the law enacted by Congress is complied with," Molloy wrote. "The issue requires immediate attention." Molloy did not prohibit the use of fire retardant before that deadline, and a Forest Service official said retardant airdrops would continue under guidelines currently in place to protect fish and wildlife habitat. Retardant airdrops are prohibited within 300 feet of waterways unless people, property, infrastructure and critical natural resources are threatened. Jennifer Jones, a spokeswoman for the Forest Service, said agency officials are currently reviewing the ruling, and will work with the Fish and Wildlife Service and the National Marine Fisheries Service to "comply fully" with Molloy's order. "We strongly agree with the National Environmental Policy Act, and protecting fish and wildlife habitat remains one of our top priorities," Jones said. "Millions of acres of national forest are at risk of uncharacteristically large and severe wildfires that can cause long-term damage to fish and wildlife habitat as well as humans, and retardant is a useful tool in fire suppression both in the wildlands and near communities." Jones said it was too early to say what the agency's next steps would be or whether it would appeal the decision. Molloy also ruled the U.S. Fish and Wildlife Service and National Marine Fisheries Service each violated the Endangered Species Act - FWS when it failed to consider retardant's effects on critical habitat for scores of species, and both agencies when they failed to specify the amount of "incidental take," or plants and animals killed, that would be permitted from fire retardant use. The lawsuit is part of the FSEEE's campaign to reform the Forest Service's wildland firefighting mission. The campaign includes banning retardant airdrops nationwide unless people or homes are threatened, focusing on fire prevention around communities, and allowing more remote wildfires to burn as a natural part of the ecosystem. Andy Stahl, FSEEE's executive director, said more plant and animal species have been jeopardized by aerially dropped retardant than any other government action in history. Stahl said by not specifying the number of species that can be destroyed by retardant use, the Forest Service "set the allowance at infinity." "The Forest Service needs to come up with retardant policies that address how, when and where they are going to use retardant, and in a way that fully protects the water, the fish and the rare plants," Stahl said. "One sensible thing to do would be to use water to fight fires instead of toxic retardant. What a wonderful idea." Stahl compared the effects of ammonium-rich retardant to that of fertilizers used by farmers on their fields. "Imagine if a farmer had a 3,000-gallon truckload of nitrogen fertilizer slurry and dumped it in the creek. Think what it would do to the fish. Any farmer who did that would be in jail in a heartbeat. Yet that's exactly what the Forest Service does when it fights fires, and there are no consequences at all." FSEEE won an earlier retardant-related lawsuit against the Forest Service when Molloy ruled the agency had violated federal law by failing to properly review the environmental impact of retardants on national forests. That lawsuit - which was filed in 2003, a year after a retardant airdrop killed 20,000 fish in an Oregon stream - was dismissed in February 2008 when the Forest Service complied with Molloy's order to complete an environmental assessment of aerial retardants. The most recent lawsuit challenged the Forest Service's assessment, which found that the chemical slurry has no significant environmental impact. In their biological opinions, however, the Fish and Wildlife Service and National Marine Fisheries Service said retardants jeopardize 45 endangered or threatened fish, plant, insect, mussel and amphibian species and their critical habitats. The Forest Service, which spends nearly 50 percent of its budget on fire suppression, has used an average of 26 million gallons of aerial retardant annually on federal lands since 2000, a figure projected to increase by more than 500,000 gallons a year at the current pace. "This case is all about getting safe effective fire management restored to the Forest Service," Stahl said. "Judge Molloy is putting the government on notice that they had better not ask for any extensions and they better have started work yesterday." Lakeside Fire District: Suspicious Fires in the Los Coches Area: Glenview: On Thursday, July 29th at 10:37 PM, two structural engines, a brush engine, an ALS medic unit, and a battalion chief were dispatched to the area of Los Coches Rd and Interstate 8 for a vegetation fire. Engine 8 (El Cajon-Madison) arrived and found a large spot burning between the eastbound lanes and the off-ramp to Los Coches Rd. A CalFire firefighter looks of the origin-cause of the fire. CAL FIRE wants you to help create a more Fire Safe, California. The ever-increasing number of structures and people in California wildlands and the growing importance of the state’s natural resources create an ever-growing need for fire prevention and planning for inevitable fires that will occur in the state. Through comprehensive engineering and law enforcement programs the California Department of Forestry and Fire Protection strives to prevent fires. Reduction of loss from California wildlands each year is the goal of extensive statewide planning by each CAL FIRE Unit, communities, coordination with non-profit groups and interagency cooperation. This section of the CAL FIRE website will provide you with information, links and resources to help you, your family, your community and cooperating and interested agencies help create a more Fire Safe, California. Please click on the following links to official CAL FIRE information, links and resources to help you, your family, your community and cooperating and interested agencies help create a more Fire Safe, California. Wildcat 2(WUF) YNP 4.5 acres, minimal fire activity. Russel Complex 250 acres - 100% contained. Nationally, there are 52 large fires being managed to achieve multiple objectives. A funeral service is scheduled for 10 a.m. Today at the Dixon Community Church, 955 East A St. Burial is at the Silveyville Cemetery, 800 S. First St. in Dixon. A reception will follow at the Dixon May Fair grounds. DIXON, Calif. — The city and its fire department are mourning the death of volunteer firefighter James "Cody" Robben, 24, who died in a crash Friday near the Sacramento Valley National Cemetery on Midway Road in rural Solano County. The California Highway Patrol said Robben's 2007 Ford F-250 work truck pulled out of a driveway of the cemetery, stopped at the fog line on Midway Road, then drove directly into the path of the oncoming 2008 Peterbilt tractor-trailer. The big rig smashed broadside into Robben's vehicle. A chaplain and a critical incident stress counselor were available at the fire station that day, Firefighter Josh Smotherman said. Smotherman said firefighters had known Cody Robben since he was a child because his father, Tony Robben, retired as captain after 30 years with the department. "He's been with us since birth. I've known him for 15 years," Smotherman said. Cody Robben joined the fire department as a volunteer in 2006. He was working for his employer, checking agricultural fields for pests, at the time of the accident, Smotherman said. "He was an awesome guy. You can't find a person to speak ill of him. He was active in fundraising and everything we did and he helped the guys under him," Smotherman said. Robben loved the outdoors and wanted to follow in his father's footsteps, Smotherman said. The Dixon Fire Department responds more often to vegetation fires than structure fires, and Robben "embraced the wildlife aspect" of the job, Smotherman said. Days before his death, Robben was off duty on July 20 when he came upon a 13-year-old boy who was unconscious on Meridian Road in a rural area. The teen was with friends and he fell and struck his head, Smotherman said. His friends could not revive him. Robben called the fire department and the boy was flown to the University of California-Davis Medical Center in Sacramento and survived, Smotherman said. "Without Cody's intervention, the results could have been tragic. This was Cody's nature; to pitch in when it was needed, anytime, anywhere," the fire department said on its website. A private family viewing will be held between 4 and 5 p.m. Wednesday at the Milton Carpenter Funeral Home, 569 N 1st St., Dixon. A public viewing will follow between 5 and 8 p.m.
A funeral service is scheduled for 10 a.m. Thursday at the Dixon Community Church, 955 East A St. Burial is at the Silveyville Cemetery, 800 S. First St. in Dixon. A reception will follow at the Dixon May Fair grounds. TEHACHAPI, Calif. — Two wildfires that erupted and spread quickly near the Mojave Desert have destroyed dozens of homes and forced evacuations in remote areas of California as hundreds of firefighters work to contain the flames. The most destructive of the fires was burning about 10 miles southeast of Tehachapi, which is about 75 miles north of Los Angeles. More than 30 homes were lost in the small hill community of Old West Ranch and another 150 structures were threatened, firefighters said Tuesday. Kern County Fire Department Engineer Anthony Romero said the fire erupted at about 3 p.m. in the area some 70 miles north of Los Angeles. It has grown to 1,230 acres, or nearly 2 square miles, according to the fire department. "The wind has been a big factor," Romero said. "It's changing on us a lot." Homes in the eastern foothills of the Tehachapi Mountains were smoldering early Wednesday, with one structure appearing to have collapsed in on itself. A singed, wooden banister was the only piece of the home left standing. About 250 firefighters from several different agencies were on the scene, along with water-dropping aircraft. Battalion Chief David Goodell said the fire was about 25 percent contained at 1 a.m. Crews were working on the southeast corner of the blaze widening bulldozer lines and setting backfires. "We're trying to put to bed a fire that could get a lot bigger," he said. Years of drought, along with tree diseases and bugs among the foothills' pine and chaparral, have turned the area into a "tinderbox," Goodell said. Wyant Winsor, 52, a delivery driver for the local school district, was working on property he owns in Old West Ranch when he saw the first smoke at about 2:20 p.m. and watched as it grew rapidly over the next half hour. When the fire department told him to evacuate, he parked his tractor in a clearing and made a run for it. "Hopefully it'll be OK. I guess I'll know tomorrow, he said with a nervous laugh. Winsor said he and a friend drove down the road through the fire with flames lapping at his truck on both sides, barely able to see the road in front of them through the smoke. Trace Robie, a housewife who lives on Old West Ranch, said the fire grew very quickly and spread through the dry brush, old oaks and pines on the steep hillside. She grabbed a handful of clothes, her dogs, her cat, a dish to give her pets water and her purse. "I always said I'd grab my photo albums but there was no time. I didn't even think about it," she said. A Red Cross shelter for displaced residents was set up at Jacobsen Middle School in Tehachapi. By late Tuesday, only 11 people had checked in, said shelter manager Leonard Arends. Arends, who lives in Tehachapi, described the Old West Ranch area as a mix of mobile homes and large new stucco homes surrounded by heavy pine and oak brush. He said the residents are a close-knit group of people, many of them retirees. In northern Kern County, a wildfire in Sequoia National Forest burned more than 11,000 acres, or 17 square miles. It earlier destroyed six homes and forced the evacuation of a camp for juvenile offenders near Kernville. It was five percent contained. The cause of the blaze, which began Monday, is under investigation. Gov. Arnold Schwarzenegger declared a state of emergency for Kern County on Tuesday, freeing up state resources to battle the fires. In far northeastern California, crews have 80 percent containment of lightning fires that have burned 250 acres of timber in Lassen County. Bull, Sequoia NF. (CA-SQF-2701) 15,586 acres, 5% percent contained. IMT 1 (Opliger). Eight miles north of Kernville, CA. Brush and grass. Active fire behavior. Numerous residences threatened. Evacuations in effect. West, Kern County FD. (CA-KRN-021461) 400 acres, 0% percent containment. Cal Fire IMT 1 (Zambro). Five miles south of Tehachapi, CA. Grass. Active fire behavior. Residences threatened. Evacuations in effect. Mono, Inyo NF. (CA-INF -934) 1,000 acres, 20% percent contained. Five miles southeast of Lee Vining, CA. Brush. Active, wind-driven fire behavior. Road closures in effect. Russel Complex, Lassen-Modoc Unit, Cal Fire. CA-LMU 250 acres with 90% containment. Previously reported as Russel (3-9). Cal Fire IMT 1 (Wallen).Nine miles southeast of Little Valley, CA. Timber. Smoldering. Modoc Lightning Complex, Modoc NF. IMT 2 (Swartzlander). CA-MDF 64 acres with 60% containment. Twenty miles southwest of Alturas, CA. Timber, brush and grass. Smoldering with isolated torching and short-range spotting. Numerous structures threatened. Reduction in acreage due to more accurate mapping. * Mcdonald (W-23), (W-23) Fire CA-NOD 750 acres with 15% containment. Northern California District, BLM. Three miles northeast of Thermo, CA. Sagebrush and grass. Active fire behavior. Constantia, Carson City Field Office, BLM(NV-CCD). 1495 acres with 51% contaiment. IMT 2 (Kidd). Five miles south of Doyle, CA. Brush and grass. Creeping and smoldering. Reduction in acreage due to more accurate mapping. Rock Creek, Winnemucca Field Office, BLM. Eighteen miles north of Gerlach, NV. Pinyon pine, sage and juniper. Minimal fire activity. Residences threatened. Incident Summary: July 22nd 2002 a lightning strike starts a fire in Stanza Creek on the Klamath National Forest. The area is steep, rugged and has limited access. Slopes range from 40 to 90%, with rock outcroppings and talus slopes.Roads are narrow and winding, often with precipitous drop-offs.The lack of access precludes efficient use of heavy equipment such as bulldozers. Take a moment today to remember these 3 firefighters from the Lassen N.F. Conditions: Since Saturday July 24, there have 5,000 lightning strikes across northeast California. 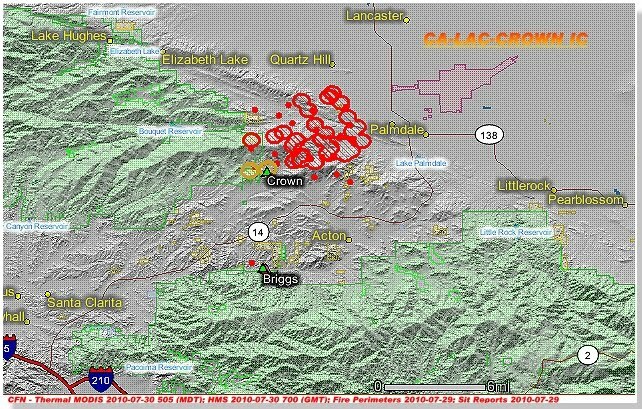 As a result 188 confirmed fires have sparked in CAL FIRE's jurisdiction and on federal lands. Over the past 24 hours there have been around 1,500 new lightning strikes. 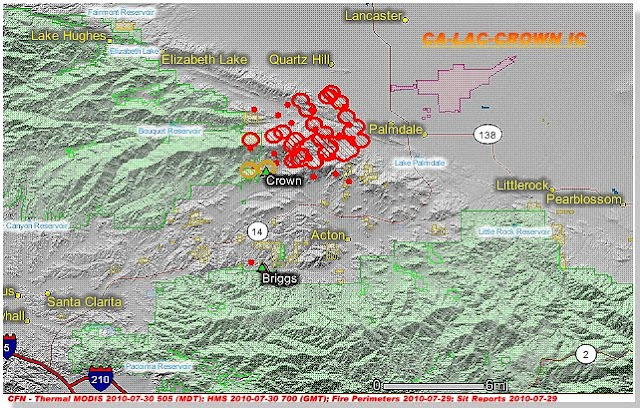 From those strikes there have been 73 new fires, 14 in CAL FIRE’s jurisdiction and 59 on federal lands. July 20 Fire Management Update: Two lightning caused fires were discovered July 19 on the north rim of the Grand Canyon of the Tuolumne River. Smoke was reported visible from the east near the Waterwheel Fall area. Yosemite received lightning the previous week along the Sierra crest. It is not unusual to find these fires a few days after thunderstorms. These remote fires are approximately at the 8000-foot elevation and within two miles of each other. They are in designated wilderness, and located in Tuolumne County. Firefighters were flown into the fire area July 20 to monitor the fires. They will gather data to assess the fire spread potential and observe fire behavior. Additionally, they will collect adjacent fuels and other vegetation information, determine fuel moistures, locate natural fire barriers, and place trail warning signs as needed. Based on the data collection the fires will be considered to be managed for multiple objectives. There are three historical fires in this area: 1948, 1985 and last year’s 2009 Wildcat fire. Tuolumne Fire: It is 1/10 of an acre and west of the Wildcat 2 fire and Rodgers Creek. It has a slight to moderate potential to spread. Light smoke was visible. It is burning in short needle conifer vegetation and brush, on a south aspect. Wildcat 2 Fire: It is 2.8 acres and has moderate potential to spread with light smoke visible. It is on the south side of Register Creek and north of last summer’s Wildcat fire. It is also burning in short needle conifer and brush, on a south aspect. Seventy-five percent of the perimeter is active and mostly burning the brush. Other Current Incidents: Footbridge Fire (Suppression): This .10 acre fire was discovered July 20 and is in Mariposa County. It is burning in heavy fuels, many of which are snags, (standing dead trees.) Light smoke was visible from Glacier point, and was dispersing to the northwest. The fire is near the Snow Creek footbridge and is northwest of Basket Dome. It is within the suppression zone, and is being put out by Helicopter 551 and helitack hand-crews. The cause is unknown. Past 2010 Incidents: The 200-acre Crane Flat Prescribed Fire (also called PW-05 Segment D) began June 29 and was completed on July 1 as 70 firefighters brought the drip torches down the fire lines to Highway 120. Firefighters used ground features and natural barriers, such as rock outcroppings, trails, and past fires to establish the project perimeter line, there-by minimizing more impacts to the land by scrapping, cutting and digging additional paths through the area. This operation is often called Minimum Impact Management Tactics (MIMT). The goal of this prescribed burn was to reduce fire fuels near the park boundary, the Rockefeller Grove of sugar pine trees, and structures located in the Crane Flat area. Contacts: Yosemite's Fire Information and Education Office at 209/372-0480 or 375-9574 and the Prescribed Fire and Fuels Office at 209/375-9576. Wildland fire activity picked up yesterday as 337 new initial attack fires were reported across the country. New large fires were reported in California (3), Florida (1) and Nevada (1). Firefighters contained 13 large fires yesterday, ten in Alaska and one each in California, Idaho and Nevada. Fire managers and initial attack resources are prepared for new starts as lightning is predicted throughout the West again today. Fifty large fires are being managed to achieve multiple objectives throughout the states. Uncontained large fires include only fires being managed under a full suppression strategy. Weather: Significant fire potential is forecast for portions of the Northwest and Northern Rockies today for lightning. Scattered to numerous thunderstorms are expected today in Northern California, the Northwest, Great Basin and Northern Rockies. Some initially dry thunderstorms are possible in eastern Washington and Wyoming. Wet thunderstorms will continue of the Four Corners states. Pat Creek (Upper Yukon Zone, Bureau of Land Management): 19,337 acres at 45 percent contained. This fire is 15 miles north of Stevens Village. Information: Visit the AICC website. Kaluktavik River (Galena Zone, Bureau of Land Management): This fire was contained at 23,269 acres. Rok North (Galena Zone, Bureau of Land Management): This fire was contained at 13,106 acres. Lake Tutusirok (Galena Zone, Bureau of Land Management): This fire was contained at 7,392 acres. Nanielik Creek (Galena Zone, Bureau of Land Management): This fire was contained at 6,538 acres. Evaingiknuk (Galena Zone, Bureau of Land Management): This fire was contained at 2,739 acres. Avan River (Galena Zone, Bureau of Land Management): This fire was contained at 656 acres. Squirrel River South (Galena Zone, Bureau of Land Management): This fire was contained at 332 acres. Timber Creek (Galena Zone, Bureau of Land Management): This fire was contained at 300 acres. Kobuk (Galena Zone, Bureau of Land Management): This fire was contained at 300 acres. Derby Creek (Galena Zone, Bureau of Land Management): This fire was contained at 23,577 acres. NEW Modoc Lightning Complex (Modoc National Forest): 102 acres at five percent contained. This complex of fires is 20 miles southwest of Alturas. Numerous structures are threatened. NEW Bull (Sequoia National Forest): 2,500 acres at one percent contained. This fire is 3ight miles north of Kernville. Numerous residences are threatened. The communities of Camp Owen and River Kern have been evacuated. Roads in the area are closed. Information: Call 760 376-3781 ext. 625 or visit the incident website. NEW Mono (Inyo National Forest): 500 acres at five percent contained. This fire is five miles southeast of Lee Vining. Road closures are in effect. Information: Call 760-873-2427 or visit the incident website. Russel (3-9) (Lassen-Modoc Unit, Cal Fire): 250 acres at 30 percent contained. This fire is nine miles southeast of Little Valley. Information: Call 530-257-9553 or visit the incident website. Potato (Owens Valley District, Bureau of Land Management): 686 acres at 70 percent contained. This fire is seven miles southeast of Bridgeport. Indian (California Desert District, Bureau of Land Management): This fire was contained at 1,822 acres. Meadow Creek (White River National Forest): 1,452 acres. This incident is 13 miles northeast of Rifle. Information: Visit the Rocky Mountain Coordination Center site. NEW Coyote (Merritt Island National Wildlife Refuge): 1,200 acres at 70 percent contained. This fire is 10 miles north of Merritt Island. Commercial property is threatened. South Trail (Boise District, Bureau of Land Management): This fire was contained at 3,889 acres. Dominic Point (Bitterroot National Forest): 897 acres. This fire is 12 miles northeast of Hamilton. The fire burned actively yesterday. Area closures remain in effect. Cardinal Creek (Flahead National Forest): 1,200 acres. This fire is f19 miles southeast of Condon. Information: Call 406-758-5376 or visit the incident website. Constantia (Carson City Field Office, Bureau of Land Management): 1,700 acres at 30 percent contained. This fire is five miles south of Doyle. Structures are threatened and roads in the area are closed. Rock Creek (Winnemucca Field Office): 6,000 acres at 10 percent contained. This fire is 18 miles north of Gerlach. Residences are threatened. NEW Seven Troughs (Winnemucca Field Office, Bureau of Land Management): This fire was contained at 3,852 acres. Hot Springs (Cedar City Field Office, Bureau of Land Management): 327 acres at 50 percent contained. This fire is 12 miles southwest of Minersville. Information: Call 435-590-5388 or visit the incident website. Swakane (Washington Department of Forestry): 19,291 acres at 85 percent contained. This fire is six miles north of Wenatchee. Information: Call 509-548 1511 ext. 524 or visit the incident website. Beach (Yellowstone National Park): 520 acres at 72 percent contained. This fire is 28 miles southeast of West Yellowstone. Information: Visit the incident web site or call 307-344-2010.